Graffiti has been around for about a century and has always been generally correlated with gang activity and the downturn of urban areas. But who is really creating all of that graffiti, and what does it truly mean for the areas in which it pops up? Here are nine statistics and facts that will give you the real lowdown on graffiti. Modern graffiti first became popular and widespread in the late 1960s and early 1970s. Members of gangs and political activists were the primary groups creating graffiti with the goal of tagging as many buildings, signs, and buses as possible. The increase in the use of the subway system in New York City also spurred artists to begin tagging trains to increase their exposure and to compete with other artists. This began the current trend of using graffiti to gain notoriety and fame. One of the greatest ways that graffiti affects communities around the United States is through loss of revenue. When public transportation, businesses, and signs are tagged with graffiti, patrons tend to avoid these businesses and services. The graffiti can give a sense that the area is not policed well and is possibly unsafe or dilapidated. Additionally, property values can be lower in areas with lots of graffiti due to concerns about gangs and the perception of decay. Cities across the United States spend a combined 12 billion dollars cleaning up graffiti each year. It is probably not surprising that the majority of people who create graffiti on the street are teenaged boys. Males between the ages of 12 and 19 are responsible for most of the graffiti created across the country. It may be surprising, however, that suburban adolescent boys are the most likely to create graffiti. And while it seems like a fairly innocuous prank, graffiti is a serious crime that can be a gateway to other crimes as the teens get older. Those who create graffiti as teens are at an increased risk of committing theft, using and selling of drugs, and other crimes in adulthood. While the origin of the graffiti varies by city, the majority of vandalism is not committed by gangs. This is a common misperception by many who assume that markings are largely created by members of a gang. In fact, more than 90 percent of graffiti is created by individuals with no gang affiliation whatsoever. Approximately half of graffiti vandalism is actually caused by suburban teen males. This is an important statistic to keep in mind when planning measures to combat graffiti, as it will require the approach to address the motivations of this group. In the process of establishing measures to eliminate graffiti, it is important to pay attention to patterns and trends. Vandals tend to be more active with creating graffiti during the summer months. Typically once the weather shifts to cooler temperatures and schools are back in session, the graffiti will level off again. As a result, homeowners and business owners in communities prone to this vandalism should remain vigilant and take protective measures, particularly during the summer months Source Tucson AZ. In addition to the summer season, in which teens spend more time bored and unsupervised, periods of tough economic times can also lead to an increase in vandalism. Smaller cities and suburbs across the United States have recognized a link between lack of summer employment for teens and a surge in instances of graffiti. Years in which the unemployment rate was high for everyone were especially impactful on the amount of graffiti that was identified. If an area is understaffed and over budget, the vandalism is even more likely to continue and worsen as there are fewer preventative measures and less intervention in these scenarios. One of the main reasons that vandals will add graffiti to signs and buildings is for notoriety, attention, and glory. Tagging or creating art with graffiti does not take exceptional talent or skill and is therefore easy for anyone to learn to do. Vandals who create graffiti often become addicted and will find increasingly riskier and more impressive places to leave their mark. This is yet another reason why it is important to remain on top of the graffiti cleanup. As graffiti murals increase around the country, many cities and communities are enforcing strict and swift graffiti removal policies. Since the goal of many graffiti artists is to gain attention and notoriety, one of the solutions to combat the sense of reward for this crime is to remove the art as quickly as possible. Additionally, graffiti that is created in an area encourages others to add their own art and tags in that area as well. Statistics show that there is a direct correlation between how quickly art is taken down and the recurrence of new art. Therefore, strict removal policies can help deter copycats and repeat vandals. The glorification of select graffiti artists over the years has given pause to some regarding the necessity to eradicate all tagging and street art. It is argued that in some places, graffiti is part of the cultural history of the area. 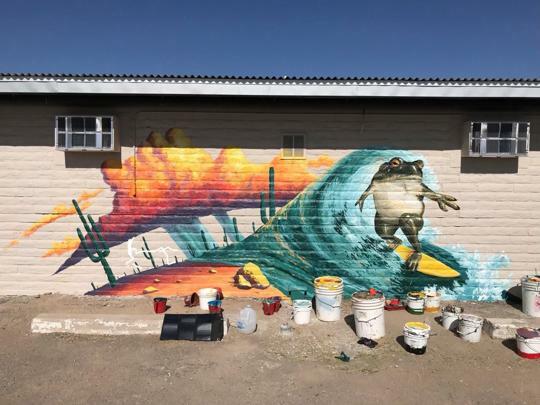 While some statistics argue that graffiti leads to lower property values and reduced traffic for businesses, others say that the cultural activity in an area actually boosts these numbers. Supporters of graffiti argue that in some cases, graffiti can convey a creative and cool vibe and entice people to come to the area, spend their money, and even make their home there.